After receiving his law degree from Villanova University in 1968, Ed chose to concentrate his legal practice on municipal law, wills and estates, real estate and commercial transactions. Ed has represented municipalities and authorities throughout Bucks and Montgomery Counties for more than forty years. Ed advises the Firm’s municipal clients on a multitude of issues including compliance with federal, state and local laws and represents the Firm’s municipal clients at public meetings and hearings. He serves as solicitor to Bensalem Township, Bucks County Board of Assessment, Northampton Water & Sewer Authority, Warwick Township Water & Sewer Authority and the Norristown Municipal Waste Authority. He enjoys using his experience to help communities find creative and effective solutions to complex problems. Ed is active in the Pennsylvania Municipal Authority Association. 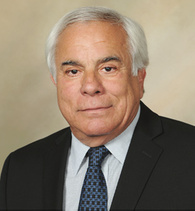 He serves as Special Counsel to Bucks County Tour of honor, served as Special Counsel to Pearl S. Buck International and is a contributor to numerous charitable, religious and education organizations. When he’s not practicing law, Ed enjoys history and foreign affairs. He is married and has four children. He credits his family with providing the positive outlook, energy, and support that allows him to succeed.